Several studies have reviewed the prognostic factors of cervical disc herniation treated by cervical discectomy and cervical fusion. Up to now, there are currently no relevant studies regarding prognostic factors using cervical disc replacement. 1-Being involved in a legal request for the permanent total disability worker’s compensation application. 2-Using narcotics to reduce pain. 3-High NDI test score (Neck Disability Index). The NDI test assesses the extent in which a cervical pathology affects the daily life. The higher the score, the less your daily life is affected and therefore there are more possibilities of recovery afterwards. However, if your score is low, it means that you are significantly affected and it would be a high indicative that it could be a not so good result. In any other case, if your situation according to the NDI Test shows a certain disability, it may not be the time to wait it may be time to try and solve the problem. 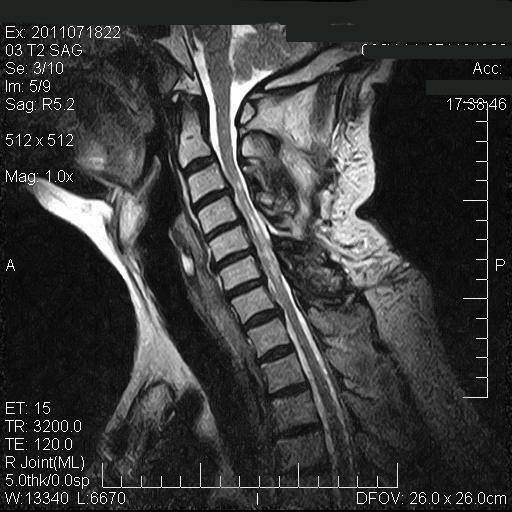 Studies (see references) show that as an example, cases where the NDI is 60% (severe disability) after surgery with the implantation of an artificial cervical disc the improvement of the NDI’s results could be between 11% and 26%. If you want to test yourself online (NDI Test), click here. These variables seem consistent as it would seem that the higher the affected nerve root due to compression by a cervical disc herniation, displayed in the form of increased deficit in sensitivity, increased pain and worse results in the NDI test, it would imply a greater recovery time after the surgery. The factors associated with being involved in an application process and the inability work, could be related to a high component of mental illness. -Spine J. 2010 Aug;10(8):689-96. The factors that influence the postoperative segmental range of motion after cervical artificial disc replacement.Kang KC1, Lee CS, Han JH, Chung SS.